This is an original pencil signed etching by American artist Stephen Parrish. 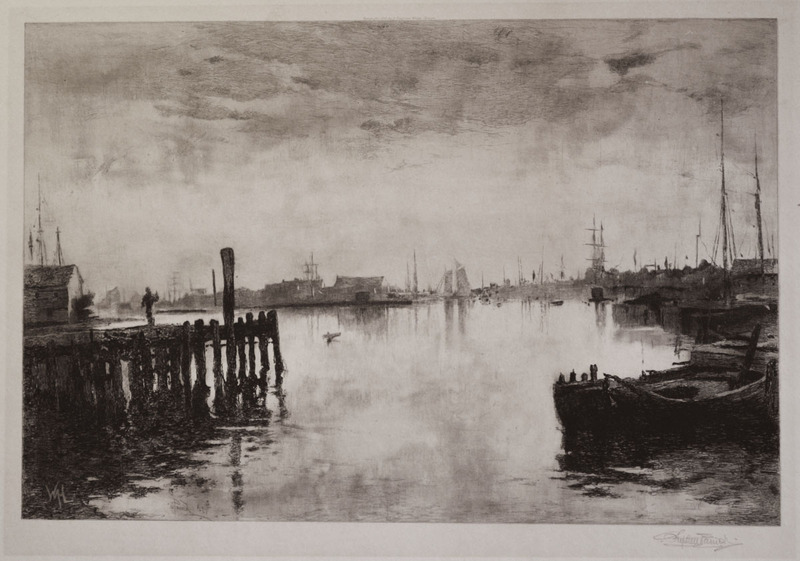 This etching titled: "Gloucester Harbor", also known as "Rainy Day Gloucester", was created and printed in 1882. It is a rare work, one of the few that Parrish did after another artists composition. This was after the painting by W.M. Hunt. Hunt's initials are etched into the plate lower left. The image measures 13 1/8X19 3/4 inches. Printed on a simulated parchment wove type paper, laid onto a thicker sheet. This is an early signed proof but done without the sailboat remarque . This etching appears in the Schneider catalog as image number 74. From the artists catalog, "June 1882, From the head of the harbor,looking south, In the right foreground, an old black hulk" beyond wharves and shipping and part of the town....In mid distance Five Pound Island."